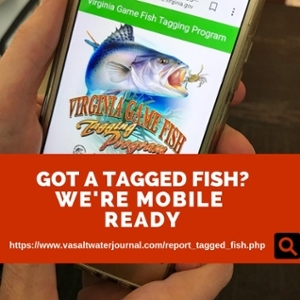 03/05/19 - The Virginia Game Fish Tagging Program (VGFTP) wants anglers to know they can use our mobile-ready platform to enter their tagged fish from their boats, kayaks and straight from the fishing pier-anywhere there’s access to the internet. Many saltwater anglers have come to rely on a whole range of widely available fishing apps that can help them improve their fishing, identify and learn more about the fishes they catch, track environmental conditions, and even communicate with other anglers. Meeting this need, the VGFTP platform provides another tool for this mobile-ready crowd so avid anglers who catch a tagged fish can easily enter their fish’s information such as number, species, date, location, length, and even choose their recapture reward. Folks getting on the water this spring can keep their eyes out for VGFTP target species such as black drum, black sea bass, cobia, grey triggerfish, red drum, spadefish, sheepshead, speckled trout, summer flounder and tautog. Please visit https://www.vasaltwaterjournal.com/report_tagged_fish.php to report a tagged fish.